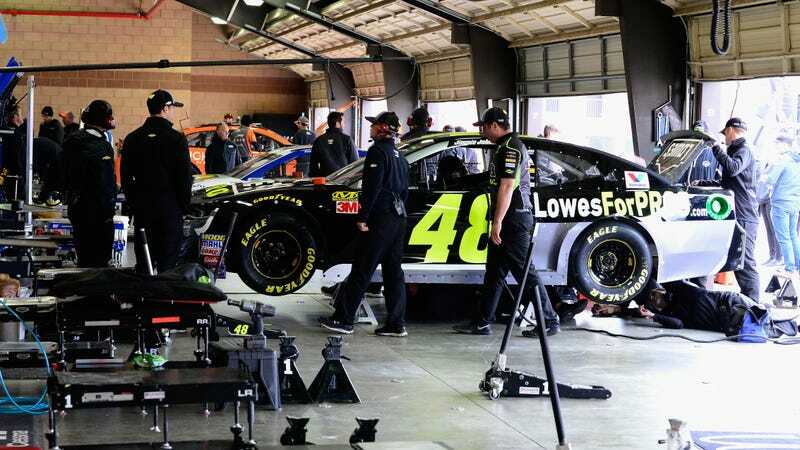 Jimmie Johnson’s team works on the car after failing inspection before the race at Auto Club Speedway in 2018. NASCAR, which has long been against taking wins away from competitors who fail car inspection, announced this week that the era of going to goofy lengths to avoid replacing the name on a trophy is over. If a winning car is illegal after the race, it will get disqualified—something that hasn’t happened in decades. That kind of penalty might sound obvious, or like it should have been around ages ago. But that’s not how NASCAR has chosen to do things for years—until now, when even executives admit there’s a “culture” of cheating in the garages. NASCAR announced a new set of rules for post-race inspections in its top-three national series—the Truck Series, Xfinity Series, and the NASCAR Cup Series—on Monday, which includes actual disqualifications as penalties. The new rules also mandate that instead of postponing thorough post-race car inspections and penalties to midweek at the NASCAR Research and Development Center, tear downs will happen at the track after the races. 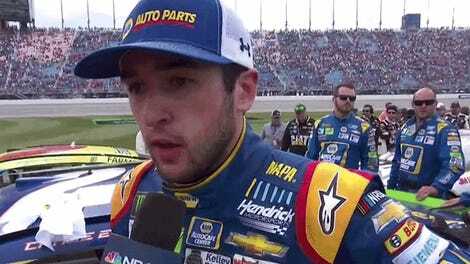 That means, according to NASCAR, everyone should know the official winner within about two hours of the race ending. Before this year, NASCAR took the vehicles of the winner, second-place finisher and another random driver from the field back to its R&D center for a thorough post-race inspection. 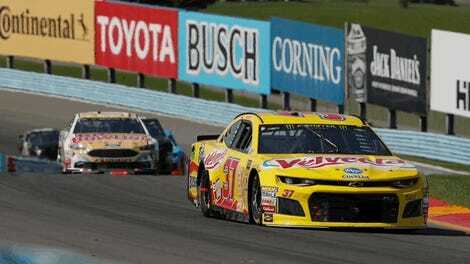 The only real change to that this season will be the timing and location, with NASCAR saying in the announcement that first place, second place and the random car will get inspected at the race track—similar to what NASCAR does for the title races, to confirm the champion the day of. Should one of those cars fail the post-race inspection, the driver and team would receive last-place points and the rest of the finishing order would move up. Disqualified teams also would be stripped of the benefits of playoff points, stage points and automatic postseason berths and playoff advancement. Playoff and stage points happen both during and at the conclusion of the race, and are part of NASCAR’s new rules system. If you’re not sure what they mean, there are explanations here. “We’ve been through a deterrence model where we’ve really worked with the race teams at the track and probably been more lenient than we should in terms of the number of times teams can go through inspection and pass, fail and there’s almost incentive to try to get something by NASCAR, so we want to really reverse that trend. Introducing disqualifications is huge, considering that, despite its recognized culture of cheating, NASCAR has long stuck by the old “fans should go home having seen the winner” mentality. With cheating cars, it’s led to workarounds like “encumbered” finishes and taking away all of the benefits of the victory but leaving the driver’s name on the trophy and at the top of the finishing order. The thing is, disqualifications won’t stop NASCAR teams from bending the rules like they do already, or probably even significantly curb it. NASCAR teams often can’t help themselves when it comes to bending the rules. NASCAR, and racing in general, is all about getting every advantage possible, whether that be tilting a windshield wiper at an angle for a minimal aerodynamic advantage, changing a paint scheme to trick an inspection system, intentionally altering cars during a victory burnout so they can’t easily be deemed illegal during inspection, body slamming cars during pit stops for aerodynamic advantages, or anything else. Whether the cheats are big or small, and whether they happen on or off the track, the teams will try them. The more NASCAR tries to curb it, the more teams try to curb things back in their own favor. The sanctioning body has talked about the mentality of not disqualifying drivers before, and it’s rooted in the idea that before the days of instant updates online, NASCAR didn’t want fans to go home and read about a different winner due to disqualification in the paper the next day. They paid to see a race, after all, and shouldn’t have to learn about a new winner later on. NASCAR’s stuck by that idea for a long time, too, saying that the last driver to be disqualified in its top series was in 1973, when team owner Nord Krauskopf didn’t let NASCAR inspect Buddy Baker’s car in the National 500 at Charlotte Motor Speedway. The last-known winner to get a DQ in the top series was long before that, even, with NASCAR saying Emanuel Zervakis got dropped to the back at Wilson Speedway in North Carolina because of an oversized fuel tank. Not that any of this matters too much, anyway. As we already said, teams will just figure out new ways to cheat, which we hope they do. Cheating in NASCAR is part of what makes things fun, even if disqualified teams might not think so. Bring on the cheating. It’s good.